There's frequently talk about Twitter's effect on the big guy, like the ones last year who had super injunctions and gagging orders and the fact that thousands of tweeters could get away with what the press couldn't. Where were you last year (2011) if you don't remember that tens of thousands of Twitter users defied a High Court ruling, to identify the footballer Ryan Giggs as the holder of a super-injunction. Read about the legal implications here. So although those "tens of thousands" got away with it, a bit of a precedent has been made with the recent case of Twitter racism - Liam Stacey RE: footballer: Fabrice Muamba. The law has clearly taken a stand, and Twitter is no longer above the law. "South Wales police have arrested a 21-year-old male from the Pontypridd area in connection with racially offensive comments made on the social network site Twitter. The male is currently being held in custody at Swansea Central police station." A district judge in Swansea called the comments "vile and abhorrent". Why?... Because... most of what people say on Twitter is said in haste and there is so so much abuse on there, why pick on one Biology student? - and I am saying that with a black husband and mixed race son - I am clearly not in favour of racism, but I am in favour of free speech. But I am not in favour of free speech that oversteps the mark.... but therein lies the problem - who defines the "mark"? Well, the law for one, and racism is, illegal, at least in this country, amongst others. Only trouble is, other Tweeters are still rampantly engaged in it, (racism and abuse of all sorts) and this one chap has been singled out.... and made an example of. That shouldn't bother me, given what he did, but I guess I also believe in fairness. Everyone remembers that the flagrant disregard for the gagging orders didn't effect Twitter users, so before people get a criminal record, surely a new message needs to go out, that Twitter is no longer above the law. I guess that is what's now happened? With this guy as the sacrificial lamb? A lot of what goes on in the news normally passes me by, or at least doesn't pray on my mind, but these recent stories have had me reading and re-reading, given what happened to me in the last few weeks [this post has been in draft for so long it is now more like a couple of months]. My negative Twitter experience was all to do with the aftermath of tweets exchanged on 22nd and 23rd February 2012, and the fact that I dared to write a balanced post about them, that included screenshots, which if you look at the online press, which I did later, is actually quite a commonplace thing to do. Anyway I was subsequently pressured to take the post down, which I did. Despite the fact that loads of people confirmed to me that it was indeed quite balanced, and the comments left on it proved that. I took it down, but it remains in draft form. Due to how the whole affair left me feeling, I went on to do my "Words Heard"You Tube video I thought it was then all okay. I thought I had put it behind me, BUT when I wanted (on 14th March) to write a 100 words post, where the prompt was "and then I turned off" that was all it took, for it to be the 1st thing that popped into my mind. BUT then on 19th March, I came across this post. It had been posted on 15th March but took 4 days for me to notice/stumble across it. Quite a lot about that post bothered me. The subject heading and the leading image for one. Getting my thoughts on that post, OUT, in a comment, again made me feel purged UNTIL I found out that my comment had been deleted. Now I did not want to write this post, which is why I didn't blog for TEN DAYS after I wrote it, and now it's been even longer. But a funny thing happened. Each night that I felt like blogging, it was like there was a queue in my head, and any other post (even 2 sponsored ones) couldn't be written until this one was out (in fact huge apologies to those companies as they still have not been. As I didn't want to write this one, and my honest brain wouldn't let me write anything other than the truth of what was in my head to write, the only way to deal with it was to sit on my proverbial hands. So in the last few weeks I have mainly only written Inner Truth posts, largely just so that I could open the blog hop linky for anyone who wanted to participate. So it was like blog or be damned, so I damned myself into silence. Now, rightly or wrongly, I have decided that if I am still feeling like this after so long, then I need to publish my comment (that was deleted from that post) here. Otherwise it makes a mockery of my freedom of speech stance. The comment (below) is my thoughts on the subject (of that call), and if it can't be published on the post, it will be published here, as is my right as a blogger. I don't want my comment to be hidden like some dirty secret. I've already lost online friends because of the whole affair........ and no longer have the respect for blogging/bloggers that I once had. Honesty seems to be cast out, as does free speech. Unless you are saying what's allowed. Allowed by who? I don’t know if I am “right” in assuming that the phone call you speak of is the one that you had with me. What you say, bears a striking resemblance to what I know was your interpretation of the call (judging by your email afterwards). My need to be right (as you perceived it), was fuelled by several comments that you made, that were wrong. One was that you’d been on Twitter and hadn’t seen me being called names - I put you straight on that one, as I was called many things by the person in question AND her followers. As you seemed doubtful of that, saying that you hadn’t seen them, I felt the need to say I had screen shots of them, which made you derisively say with a sneer: what so you can do another post? To which I replied “no”, I have them in case they are deleted. 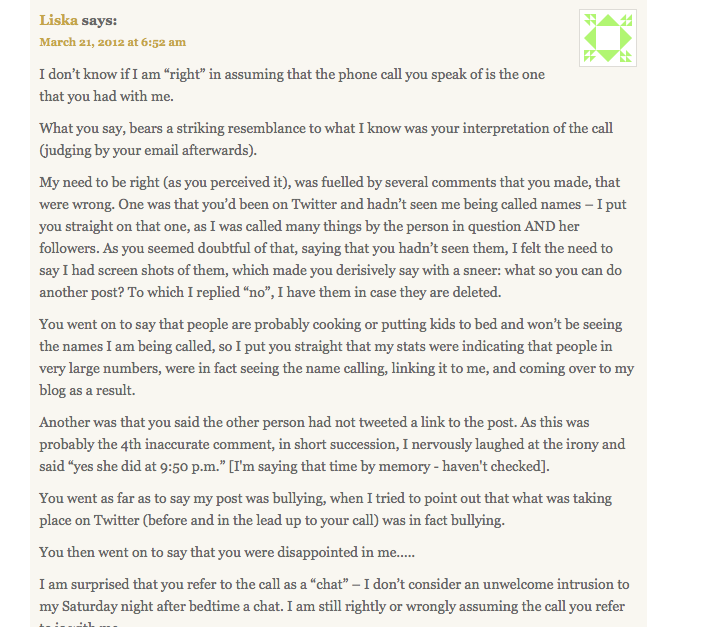 You went on to say that people are probably cooking or putting kids to bed and won’t be seeing the names I am being called, so I put you straight that my stats were indicating that people in very large numbers, were in fact seeing the name calling, linking it to me, and coming over to my blog as a result. Another was that you said the other person had not tweeted a link to the post. As this was probably the 4th inaccurate comment, in short succession, I nervously laughed at the irony and said “yes she did at 9:50 p.m.”. 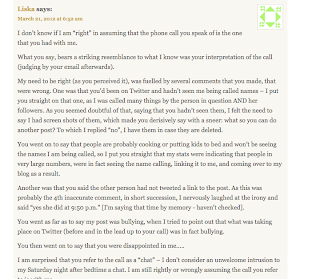 You went as far as to say my post was bullying, when I tried to point out that what was taking place on Twitter (before and in the lead up to your call) was in fact bullying. I am surprised that you refer to the call as a “chat” - I don’t consider an unwelcome intrusion to my Saturday night after bedtime a chat. I am still rightly or wrongly assuming the call you refer to is with me. Each time I was being right about something it was about a fact, not a grey area open to interpretation. You also said I wouldn’t feel happy until I took the post down - you were also wrong about that. I did it to keep the peace (despite you saying that neither party wanted to down weapons), but it wasn’t the right thing for me! The whole scenario left a nasty taste in my mouth... and I was a little gutted to see reference to it here as I was hoping to put it behind me, as you advised I should do. Despite this post being published on 15th March I only stumbled across it on 19th March, and I did have serious reservations about posting a comment, but decided that I would. Given what is now happening on Twitter to Tom Daley, I was correct in my assertion that the right way to deal with it, is as malicious comms. Read this. Anyway, I have screen shots of everything that was said about me that night, so I have the required evidence should anyone ever doubt what took place. Look at the outcry that occurs when a celebrity and much loved diver/athlete is upset. It isn't so when it happens to a member of the public, but at least all these test cases will make people realise that Twitter is not a place to use and abuse people!